Tenor player Eddie Barefield was in some of the most important bands in Jazz history including those of Bennie Moten, Fletcher Henderson, and Don Redman! The year before he passed away, he celebrated his 80th birthday and played a set that included Wes Landers on drums and trombonist Shorty Jackson. 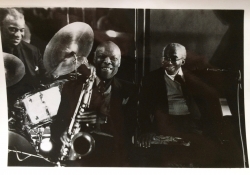 All three musicians are featured in this photograph from the event, a one-of-a-kind item from an important Jazz veteran. L to R: Wes Landers drums, Eddie Barefield, Shorty Jackson.